Find some natural tranquility without leaving the city limits at Nakajima Park, home to a lake, museum, concert hall, observatory, tea shop, and a forests with over 5,000 trees like Japanese red spruce, ginkgo, black acacia, and elms. Join the locals for a jog, walk your pet, or just relax among the greenery. Warmer weather brings about food vendors offering local cuisine, while snow means free access to ski equipment to be enjoyed on site. 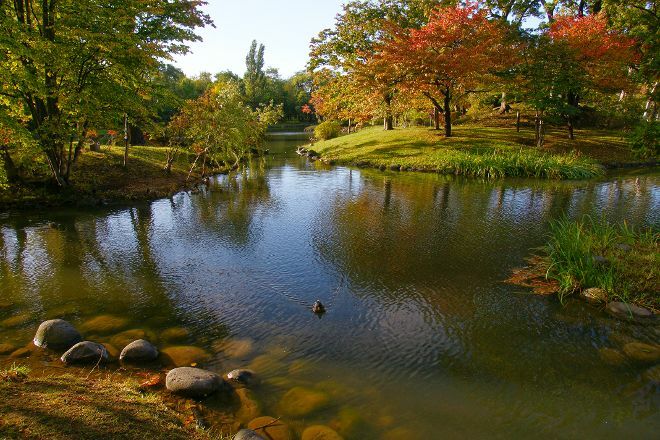 Plan to visit Nakajima Park during your Sapporo vacation using our convenient Sapporo trip planner . When you think of the Olympic Park in Korea. Located in the city and well decorated set is a good place to take a walk. In the vicinity of the caustic, non-good:. Probably looks really nice in spring or summer but I was here during winter. The park was covered in snow and it looks pretty in a different way. The concert hall looks great as well. It is very beautiful and peaceful in winter. It is a snowy scenery haven. There is a giant telescope observatory in Nakajima Park that could see venus but it was closed for the winter. However, the lone staff tending to it turned the area outside the observatory into holiday snow sled station. He was very enthusiastic and pleasant. Definitely a good memory during my stay in Sapporo. Upon arrival at CTS International Airport on May 7, 2018, I sought advice from the Tourist Information Centre there. Nakajima Park was the only place that sakura blossoms chasers like me would still be delighted with the sights. I wasted no time to get there to capture the last sakura blossoms in Japan 2018！ Postscript On Sunday, February 10, 2019, at Sapporo’s Snow Festival’s Susukino site, I saw a promo that the Garden would light up for the last time that night. I seized the opportunity to go and see it as I did rowing at its lake months ago. The little lights put up there did drive away some darkness! This is a beautiful park to walk through or to sit at the benches and eat. The fragrance of the tree in fall is incredibly beautiful. I've been told the cherry blossoms can be viewed here in the spring. Very beautiful Park to walk around. They have seats around the lake and the subway station. Lovely! Every day, we help thousands of travelers plan great vacations. Here are some tips on how to use your Listing Page to attract more travelers to your business - Nakajima Park. Promote your permanent link - https://www.inspirock.com/japan/sapporo/nakajima-park-a152600133 - on your website, your blog, and social media. When a traveler builds a plan from this page, the itinerary automatically includes Nakajima Park. This is a great way for travelers looking for a great vacation in your city or country to also experience Nakajima Park. Promoting your link also lets your audience know that you are featured on a rapidly growing travel site. In addition, the more this page is used, the more we will promote Nakajima Park to other Inspirock users. For best results, use the customized Trip Planning Widget for Nakajima Park on your website. It has all the advantages mentioned above, plus users to your site can conveniently access it directly on your site. Visitors to your site will appreciate you offering them help with planning their vacation. Setting this up takes just a few minutes - Click here for instructions.